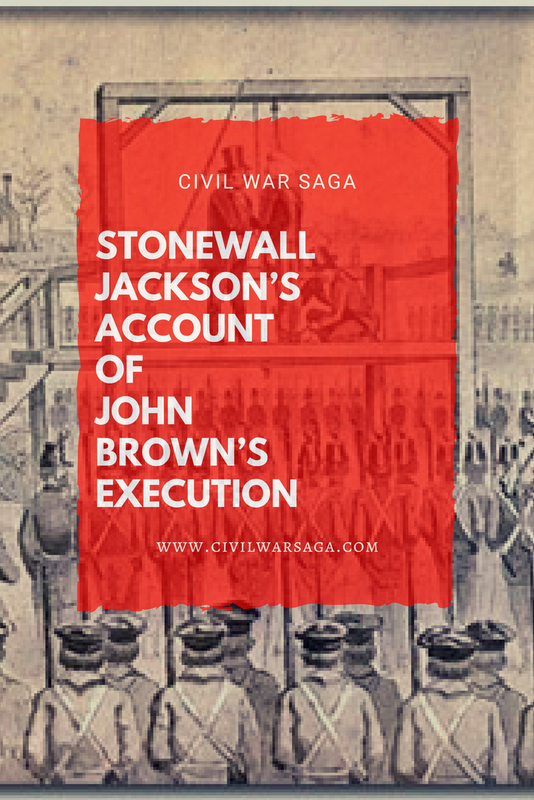 Stonewall Jackson was a professor at the Virginia Military Institute in December of 1859 when he was ordered, along with his cadets, to provide security at John Brown‘s execution in Charlestown, Virginia. 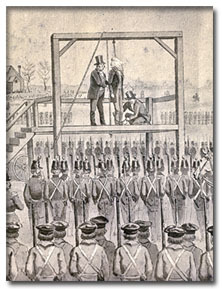 John Brown had recently been condemned to death after his failed raid in October on Harper’s Ferry in Virginia. After rumors began to swirl that some of Brown’s supporters were planning to rescue Brown at the execution, Virginia Governor, Henry A. Wise, ordered 1,500 soldiers to Charlestown to make sure the execution took place. Also present at the execution was actor and future presidential assassin, John Wilkes Booth. Booth was in Virginia rehearsing for a play when he spontaneously volunteered to serve as backup in the local volunteer militia the Richmond Grays, who were also on hand to thwart any rescue attempts from Brown’s supporters. Stonewall Jackson, who was then known as Professor Thomas J. Jackson as he didn’t earn his famous nickname until the first Battle of Bull Run in 1861, wrote a letter to his wife Mary Anna Jackson on the day of the execution, detailing the event. “December 2. John Brown was hung today at about 11 1/2 A.M. He behaved with unflinching firmness. The arrangements were well made under the direction of Col. Smith. Brown’s wife visited him last evening. The body is to be delivered to her. The gibbet was south east of the town in a large field. Brown rode on the head of his coffin, from his prison to the place of execution. The coffin was of black walnut, enclosed in a poplar box of the same shape as the coffin. He was dressed in carpet slippers of predominating red, white socks, blacks pants, black frock coat, black vest & black slouch hat. Nothing around his neck beside his shirt collar. The open wagon in which he rode was strongly guarded on all sides. Capt. Williams, formerly one of the assistants of the Institute, marched immediately in front of the wagon. The jailer and high sheriff and several others rode in the wagon with the prisoner. Brown had his arms tied behind him, & ascended the scaffold with apparent cheerfulness. After reaching the top of the platform, he shook hands with several who were standing around him. The sheriff placed the rope around his neck, then threw a white cap over his head & asked him if he wished a signal when all should be ready—to which he replied that it made no difference, provided he was not kept waiting too long. In this condition he stood on the trap door, which was supported on one side by hinges, and on the other (south side) by a rope, for about 10 minutes, when Col. S. told the Sheriff ‘all is ready,’ which apparently was not comprehended by the Sheriff, and the Col. had to repeat the order, when the rope was cut by a single blow, and Brown fell through about 25 inches, so as to bring his knees on a level with the position occupied by his feet before the rope was cut. With the fall his arms below the elbow flew up, hands clenched, & his arms gradually fell by spasmodic motions—there was very little motion of his person for several minutes, after which the wind blew his lifeless body to & fro. His face, upon the scaffold, was turned a little east of south, and in front of him were the cadets commanded by Major Gilham. My command was still in front of the cadets, all facing south. One howitzer I assigned to Mr. Truheart on the left of the cadets, and with the other I remained on the right. Other troops occupied different positions around the scaffold, and altogether it was an imposing but very solemn scene. I was much impressed with the thought that before me stood a man, in the full vigor of health, who must in a few minutes be in eternity. I sent up a petition that he might be saved. Awful was the thought that he might in a few minutes receive the sentence ‘Depart ye wicked into everlasting fire.’ I hope that he was prepared to die, but I am very doubtful–he wouldn’t have a minister with him.